I heard a story this week about a man who suffered a business failure, personal financial ruin, a devastating health crisis, family deaths, and mental health trauma. The Book of Job has been on my mind in recent weeks (see Lessons from the Book of Job), sparked by a conversation I had with Michael Halloran prior to his live presentation this week before a large audience. I told him that his story was somewhat of a Job story. Michael’s testimony has also been captured in the popular book Finding God in the Silicon Valley.2 The full details of the sequence of tragic events hitting one man and his family is enough to have anyone else count their blessings in comparison or cringe to imagine experiencing just portions of the trauma that occurred here. And yet the peace of God and a renewed life and heavenly perspective is what emerged from this disastrous series of experiences. While living through a miraculous recovery from a life-threatening brain tumor, today Michael’s business and finances have now been fully restored and blessed beyond his wildest expectations. Even so, Michael’s family is still recovering from emotional and psychological scars of his bad-to-worse onslaught of events. So where’s God in this? Recall the wonderfully prosperous life of Job suddenly getting derailed through no fault of his own beyond the spiritual negotiations between God and Satan in the spiritual realm unseen. Yes, sometimes bad things happen and we cannot understand or do anything but weather the storms that wreak havoc in and around us. We can rail against God, or in the case of Job, take on the abuse of well-meaning but cruel friends whose human rational is flawed and found wanting. While sometimes we reap what we sow or pay the consequences of our own actions, this was never the case with Job. Though Holy God certainly has and will allow human pain and suffering in a dying world that been provided a redemptive out through Christ’s atoning death for human sin, God operates in a spiritual dimension or realm that is beyond mystery or human comprehension. 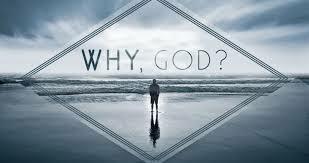 As Job and Michael Halloran found out, we can only endure and know that we do not understand what God is doing. But He is there and involved. And in the long run, for those that love Him (Romans 8:28), the results in this life (maybe, maybe not), certainly in eternity, are only for good. And then in chapters 38-41, God speaks directly to Job and essentially echos even more pointedly the wise words of Elihu. Our takeaway is that God is way, way beyond our poor power to fathom and grasp His ways. But as great and glorified and Almighty as He is, He is well aware of all things human – the good and the bad, the wins and the losses, the joy and the pain. He is just, good and inscrutable. He deals with the wicked, in time. We are to fear and revere Him, honor, love, and worship Him. His view and purpose for us in this short lifetime is but a glimpse of the richness and fullness that is awaiting in eternity for those who believe and obey Him. With that perspective, may we ably endure the wonderful highs and terrible lows until we all return home to unspeakable joy. 1 ENGAGE, http://www.connect.sv (formerly The Silicon Valley Prayer Breakfast – Quarterly Networking Event), February 6, 2019. 2 Finding God in Silicon Valley – Spiritual Journeys in a High-Tech World, by Skip Vaccarello, Creative Team Publishing, 2015, pp. 145-161.